Thoughts on, and a place to discuss, the plot points we can’t reveal in our review. Rogue One’s main cast has a survival rate of zero. With some minor exceptions, every named character original to the film dies: killed by blaster fire, blown away by explosives, buried in tidal waves of debris, vaporized by the Death Star. The ending is the strong point of the film; with the heroes dead, we watch nameless Rebel soldiers scramble to complete the mission, cut down one by one by the merciless red beam of Darth Vader’s lightsaber. This is as close as the series has gotten to exploring the Death Star as a metaphor; it is understood to be an inevitable and almost elemental part of the cycle of good and evil in the Star Wars universe. Mads Mikkelsen’s Galen Erso knows that the Empire will build a super-weapon with or without his help, so he surrenders the last 15 years of his life to work for the people he hates most and ensure that their death machine has a secret weak spot: the tiny exhaust port that Luke Skywalker will hit with proton torpedoes in A New Hope. 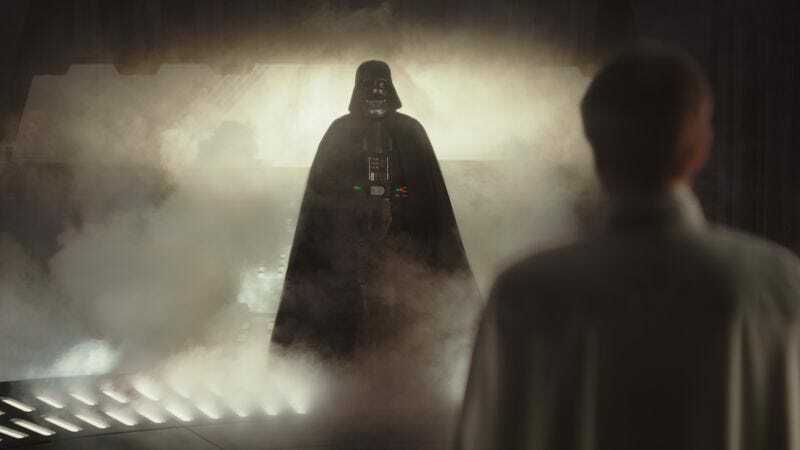 On a rudimentary level, Rogue One’s arc is one of the best in the film series. The good guys sacrifice themselves for some small part of a larger cause. The bad guy, Krennic, is wiped away into nothingness by the symbol of his own ambitions, the Death Star. His fails because he wrongly believes that he is irreplaceable; they succeed because they realize that they’re expendable. But this narrative is betrayed in some respects by the underdeveloped characters. Simply put, it’s tough to give a damn about these fictional people, good or bad. (That’s really The Force Awakens’ strong suit: charismatic heroes and a genuinely interesting villain.) One can’t help but say something here about the economics of character death; if Rogue One weren’t a Star Wars spin-off, it’s unlikely that a major studio would have sunk so much money into a movie where none of the heroes lives to see the end. And the bleakly hopeful ending has its advantages: It keeps the continuity clean. Shame about that CGI Leia, though.